I have a wall hanging ready to be quilted and I decided to leave﻿ it on the wall until I get it done. It's small, only about 25" square and I'm going to quilt it on my domestic machine but I just have not made the time to do it. Hopefully I'll get to it this week, but since it's senior finals week, I'm not promising anything. Does it look familiar? It should. 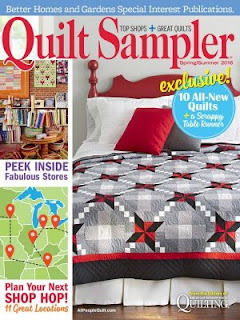 It's a three fabric version of the quilt in Quilt Sampler that I posted about last week. When we were first working with the quilt for the magazine, I decided that I needed to make a smaller version so we could decide if we liked the color placement. Below is my first version of the quilt, and as you can tell the leaves were falling so this was way back in the fall. Although we liked the color placement, I did change to piano key borders. I still really like the mini version of the quilt and so do Mabel and Ethel. Because of that, they are offering a kit for four sizes - the mini version (25" square), 40" square and 60" square, and the 105" version in the magazine. YIPPEE!! In other news, Jack and I were in Philadelphia this past weekend for a college graduation and we encountered rain, sleet, and snow on the way home. Really!?!? It's mid-May and we had snow. I decided that when I got home, I NEEDED to relax and listen to the purr of my sewing machine so I decided to piece some strip sets I'll be using later this week when I play with an idea that I have. Here is the stack of ten strip sets, (8 strips in each), ready to be pressed and sub-cut. There is some slicing and dicing that will take place with these strip sets, so be sure to come back and check on the progress. What is on your design wall today? Really like both versions of the star quilt. Hope you get time to finish off the mini this week. Have to try and find that magazine somewhere. 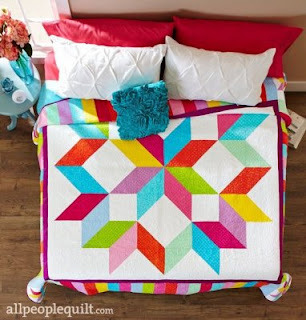 I would love to make the big quilt!